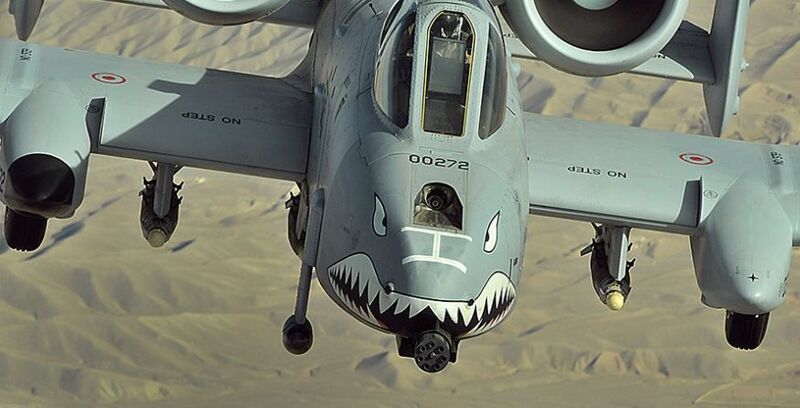 Technically, the A-10 Thunderbolt II, also known as the Warthog, is a straight-wing, highly maneuverable, close air support aircraft powered by two turbofans, armed with a gatling gun, rockets, and other weaponry. However, the A-10 is basically a flying 30mm cannon. 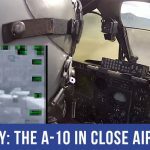 Designed solely for close air support, the A-10 is a welcome site to any infantryman who is engaging hostiles targets like tanks, armored vehicles, and other ground threats. The A-10 is heavily armored, flying low and slow over the battlefield, loitering for long periods of time searching for target opportunities or answering calls for air support from ground troops. 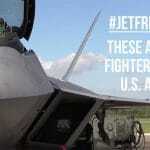 It’s a remarkable aircraft built to absorb significant damage and still continue to fly. When a pilot is flying at slow speeds at low altitude where most threats exists, they appreciate the durability of the A-10. Efficiency – The A-10 only requires a crew of one – the pilot. It has a cruising speed of 340 mph, allowing it to fly carefully and deliberately to pick out potential ground targets. While performing close air support, the Warthog has a combat radius of 288 miles and can loiter over a battlefield for nearly two hours under a 5,000-ft. ceiling. It can take off and land on short runways, making it ideal for a diverse set of environments and mission profiles. Its major components, including engines, are interchangeable from the left to right side, making it easier to maintain at the front lines. The A-10 is equally deadly at night, making use of night vision goggles and the Night Vision Imaging System. 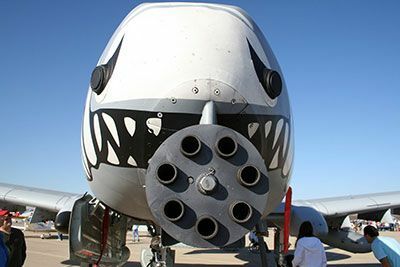 Armament– In addition to six infrared guided AGM-65 Maverick air to surface missiles and 2 AIM-9 Sidewinder air to air missiles for defense, the A-10 carries the GAU-8/A Avenger Gatling-type 30mm, a hydraulically driven seven-barrel cannon that fires either depleted uranium armor piercing incendiary shells or high-explosive incendiary shells at 4,200 rounds per minute. The armor-piercing round can penetrate armor of up to 69mm thickness. At 4,000 ft range, 80% of the rounds will hit within a 40 feet diameter circle. The Avenger is the heaviest automatic cannon attached to any aircraft. When viewing the aircraft from the front, a common perception is that the cannon is offset from the landing gear to strictly allow for room. This is only partly true. The fact is that the gatling cannon fires out of the tube at the 9 o’clock position. This tube is aligned with the center of the Warthog, allowing the cannon to be fired without violently pushing the aircraft off its flight path. Protection – The Warthog’s construction makes it exceptionally tough. To protect the pilot as well as part of the redundant hydraulic flight controls system, most of the plane is surrounded by a tub made of titanium armor. The armor is .5 to 1.5 inches thick. The pilot’s canopy and front windscreen are resistant to small arms fire. 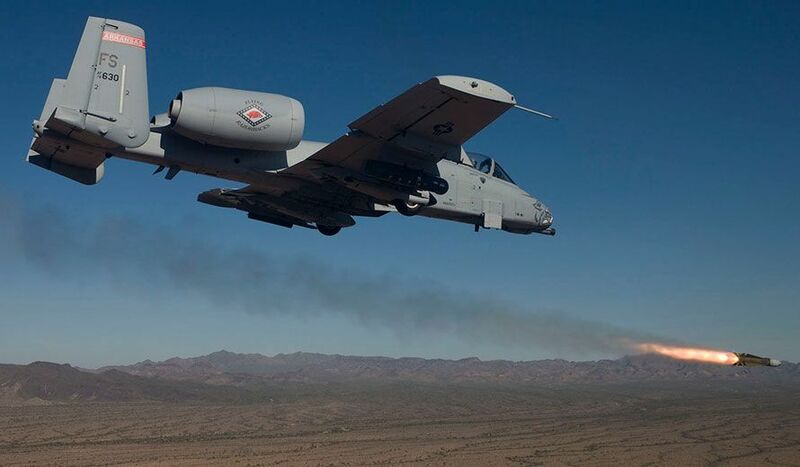 The aircraft’s design allows the close air support jet aircraft to survive direct hits from armor-piercing and high-explosive projectiles up to 23mm. It can fly with only one engine, one tail, and half of a one wing missing. Camouflage – With the A-10 flying low and slow over the terrain, camouflage is very essential to its mission survivability. The paint scheme most often found on the fuselage is called “Compass Ghost.” This two-tone color is a dark gray on top and lighter gray on the bottom of the aircraft. 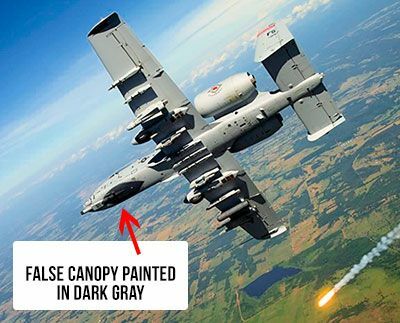 Often, the A-10 will have a false canopy painted in dark gray on the bottom of the fuselage to confuse the enemy of the aircraft’s altitude and direction. 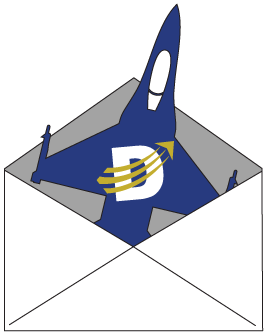 The A-10 has been scheduled for retirement multiple times. Every time it is given the opportunity to perform its mission, the A-10 proves its worth. It is getting older – the last time an A-10 was produced was in 1984. 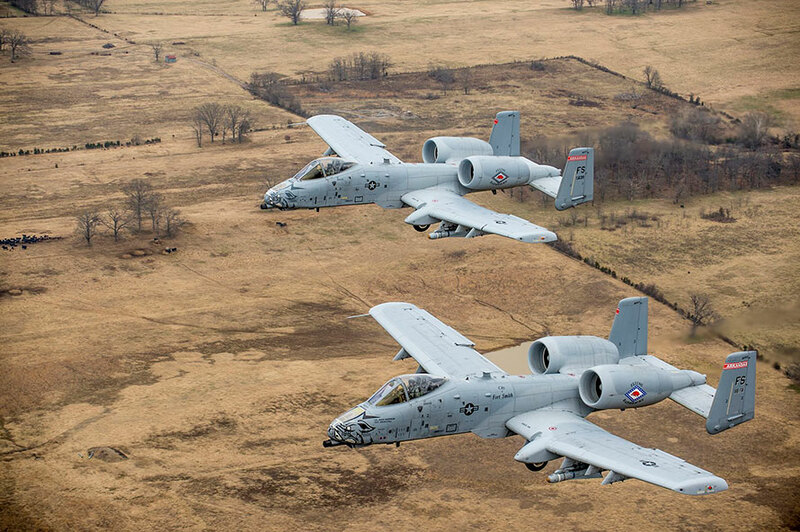 However, a total of 715 delivered to the U.S. Air Force, and with the upgrades to its avionics, wings, and other vital parts, the A-10 will be cheaper to maintain than other alternative platforms and will be answering the call for close air support through its extended operational date of 2028.